The Chemist Warehouse Australian Opals have continued their winning streak at the 2018 FIBA Women's World Cup, dispatching China 83-42 in the Quarter-Final. The Opals will now await the result of Canada vs. Spain to find out their opponent in tomorrow night's Semi-Final. They do know that they will compete for their fifth medal at the past six tournaments though, after winning bronze medals in 1998, 2002 and 2014 as well as a gold medal in 2006. As has been the case throughout this year's World Cup, Australia provided the knock-out blow in the first half with China unable to find an answer at either end of the floor. However, even after a devastating opening two quarters, the Opals still extended their lead following the main break in another dominant performance that never saw them trail for the fourth consecutive game. China had the front court size to match Australia but Liz Cambage (20 points, nine rebounds, two steals, three blocks) made a statement with two big rejections inside the first two minutes. 🇦🇺 @BasketballAus' @ECambage right back at it! She combined with Bec Allen to score Australia's first 16 points at the other end of the floor as well. Allen (16 points, two steals) drilled her first two attempts from beyond the arc and showed an intent to get China on the ropes as quickly as possible. Captain Jenna O'Hea (three points, one assist) then made a triumphant debut at the 2018 FIBA World Cup, recovering from a calf strain and hitting a reverse lay-up on her first touch. Alanna Smith recorded a turnaround basket and block off the bench too, capping a 24-7 first term in another devastating opening stanza as Australia held China to 3-15 (20%) shooting. With Cambage resting at the start of the second quarter, the Opals' offence did not slow down and it enabled the centre to sit for the entire term. Cayla George (three points, four rebounds) chimed in from long range, Katie Ebzery (three points, three assists) connected on a three-point play and Alex Bunton asserted herself down low as the Opals' machine powered on. Their team defence was just as exemplary, forcing a couple of shot-clock violations and keeping China to 24% shooting overall including 2-11 from distance by half-time. China picked up their intensity in the third, forcing Australia into a string of turnovers and going on a 14-3 run after the Opals had opened up a game-high 31-point lead. Sami Whitcomb (five points, six boards) put an end to the momentum swing though, finding an open Cambage on the three-quarter time buzzer with a series of silky moves that showed she is not just a scoring threat but a serious play-maker. 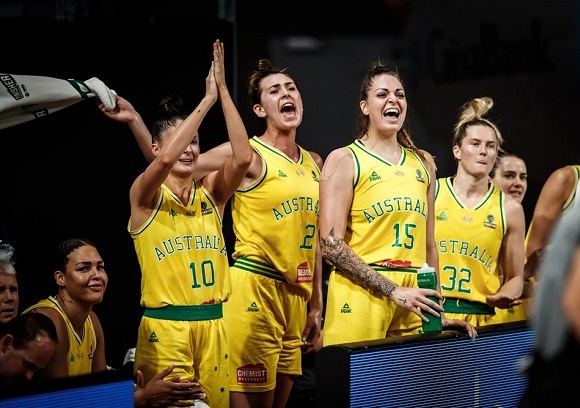 Despite a strong period of play from the Chinese, it only took 90 seconds into the fourth term for Australia to establish a new game-high lead when Smith (seven points, five rebounds) and Bunton (eight points) connected. Tessa Lavey (two points, four assists) and Tess Madgen (two points, three assists) then drained buckets to ensure every Aussie hit the scoreboard, the first time 12 Opals have achieved the feat this tournament as they went on to secure their equal-biggest win of the 2018 World Cup. Stay tuned to Basketball Australia for updates on game time and opponent for the Opals' Semi-Final on Saturday night.